Homeopathy Embarrassing to Integrative Medicine: Perhaps we should celebrate the distancing from homeopathy of many ‘integrative medicine’ specialists – but does this just help them push other pseudoscientific practices? “…What are they integrating? They mostly rebrand diet and exercise as if it is alternative (it isn’t) and add a generous helping of outright quackery. Integrative medicine brings nothing new to the table that is not pseudoscience”. If you feel better, should you stop taking your antibiotics? : Given the frequency with which we use antibiotics, and the justified concerns about growing rates of antibiotic resistance, we need more evidence to inform decision-making, and we need better adherence to the evidence that actually exists. If one in three antibiotic prescriptions are unnecessary, then let’s focus on stopping them before we start. Where there is evidence that shorter courses of antibiotics are as effective as longer ones, then we need to ensure that physicians are prescribing according to best practices. And where we don’t actually know the optimal duration of therapy, then we need research to answer those questions. Before we recommend a “stop when you feel better” approach to antibiotics, we need evidence that we’re not doing more harm than good. 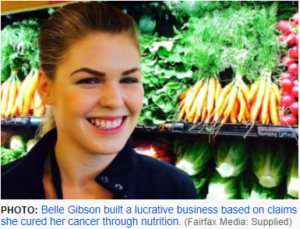 Belle Gibson, fake wellness blogger, fined $410,000 over false cancer claims: Fake wellness blogger Belle Gibson has been ordered to pay a fine of $410,000 after being found guilty of misleading and deceptive conduct earlier this year. Flu is a tragic illness. How can we get more people to vaccinate? : Flu (influenza) has traditionally been the underdog of vaccine-preventable diseases. People tend not to worry about the flu too much, and there are various myths about its prevention and the vaccine. It’s true most people experience flu as a mild disease, but many don’t recognise it can be more severe. Each year flu is estimated to kill at least 3,000 Australians aged over 50 years alone. It took more children’s lives than any other vaccine preventable disease in Australia between 2005-2014, and is the most common vaccine preventable disease that sends Australian children to hospital. The tragic death of eight-year-old Rosie Andersen from flu this week has followed the recent outbreaks in aged care facilities and subsequent deaths of residents in South Australia, Tasmania and Victoria. A 30-year-old father died earlier this month due to complications from the flu, and now Sarah Hawthorn, who was infected late in her pregnancy, remains in a coma, unaware her baby was safely delivered six weeks ago. There cannot be two kinds of medicine: EU scientists shred homeopathy, alt med: There cannot be two kinds of medicine—conventional and alternative. There is only medicine that has been adequately tested and medicine that has not. The Invention of The Defibrillator: A brief history of the defibrillator and how it saves lives: . Having saved thousands upon thousands of lives, it is interesting to note that (unlike in Hollywood) the defibrillator does not work on hearts that have stopped beating, but rather hearts that are beating in certain irregular and dangerous rhythms.